The Heavenly Banquet: What shall we make of those pears? 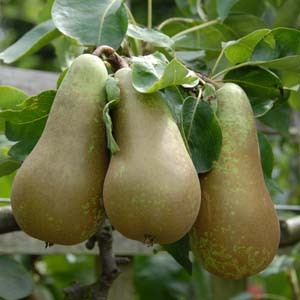 What shall we make of those pears? The following is a reflection from David Roquemore on the famous incident in Book II of the stealing of the pears. What do you think? For several chapters of Book II, Augustine talks about his youthful lusts and how his mother warned him not to indulge his sexual appetites. Reading this, you get the sense that he is leading up to some great event, some life-changing moment. Perhaps he will throw himself into debauchery. Perhaps he will violate some innocent maiden. When the great sin is revealed, he has stolen some pears from a tree. When I read the Confessions in the past, I took this at face value, but this time, I wondered if this were to be taken literally? Is this a metaphor? Is this an allusion to the forbidden fruit of Genesis? For much of the book, it is Augustine’s sexual appetite that is the issue. He is constantly tempted by the “mists of passion.” He famously prays for chastity -- later. And so I wondered if here he has something in mind that he cannot bring himself to tell. It doesn’t seem likely that he is hiding something, but even so, does the pear incident come to his mind more as a metaphor for the other sins he struggled with than as a turning point in itself? If it is literal, it seems that in his mind it wasn’t the pears that mattered -- after all, really, the owner of an orchard will not miss them. But that he took them and threw them away, without eating them - this is his sin. He says in chapter VI, “I stole those simply that I might steal, for, having stolen them, I threw them away. My sole gratification in them was my own sin, which I was pleased to enjoy; for, if any one of these pears entered my mouth, the only good flavor it had was my sin in eating it.” So then, what is it that really bothers Augustine here? It doesn’t seem to be the pears themselves. He understands that stealing them was wrong, and that wasting them added to the wrong. He didn’t take them because he was desperately hungry. He took them for the sheer pleasure of sinning. The issue hovering around all of this seems to be the pleasure he took, and that we all take, in doing what is wrong. It isn’t the pears, or the revelry, or the women; it is the perverse pleasure in sinning that he enjoys. That is the spiritual issue he seeks to confess and analyze. I read this story as an actual incident from Augustine's life, and I think it's perfectly suited to illustrate just how pointless and inexcusable sin is. There is no way in which Augustine can rationalize or even begin to understand his motives for stealing those pears. He notes that he had no need of them to satisfy a hunger as he "already had plenty of what [he] stole, and of much better quality too" (II.4.9). He also dismisses any notion that he might have been seeking some revenge upon the owner of the pear tree. As he writes, "I was greedy for another person's loss without any desire on my part to gain anything or to settle a score" (II.9.17). The best explanation Augustine can offer is that the theft was the result of peer pressure and that he only participated in the act to impress this gang. Ultimately, he concludes that this understanding is unsatisfactory as there is no good reason why he should have wanted to follow this disreputable herd as he had nothing to gain from their company. The act was nonsensical, depraved, and seemingly compulsive. These are claims that we could make of all sin, but this theft is so irrational that it best makes his point. Even Augustine remarks that we can often begin to understand the motives of the man who commits homicide (II.5.11), and our understanding of the motives may help us rationalize away the sinfulness of an act. This incident with the pears is so completely senseless that it lays bare the nature of sin and offers Augustine a point of contemplation and exploration.